the usable range of the throttle knob. 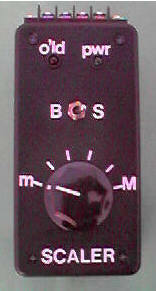 The throttle knob on the average commercial power pack (MRC, etc.) has a rotational range of about 270 degrees, usually labelled something like 0% to 100%. Locomotives start moving somewhere between 10 and 15%, and most of us never move the throttle past the 50% point. Worse, when working the yard or an industrial area, we usually don’t exceed 25%. It’s like we’re always operating in high gear, when what we may want is first or second gear. What we’re seeking is resolution….and most commercial power packs just don’t offer it. Sound familiar? Then you’ll want to drop whatever you’re doing and build yourself a NAT. NAT’s not a throttle….it’s a throttle Output Scaler. It offers seven different “gears,” and allows you to use almost the full rotation of your throttle knob within a narrow range of loco speeds. This is RESOLUTION in spades! It’s an easy-to-build project that all fits in one “project box,” and the parts will cost you about $10-12 in the basic form. Add the “Overload” and “Power” indicators (I did), and the parts cost slithers up to perhaps $15. You’ll be amazed at how much more CONTROL you’ll have over your locomotives. 1. Transistors Q1 & Q2 are power “Darlingtons,” and will get quite warm; heatsinks are necessary — the best ones you can manage. Ventilation is good; try to provide some if you seal NAT up in a box (just drill some holes on both sides). 2. The “Overload” indicator (red LED) doesn’t do anything to the circuit, it just reminds you that you’re starting to draw more current than NAT would like to supply. Resistor R12 sets the “Overload” point for the LED indicator; the value shown in the Parts List (0.33 ohm, 2 watt) will start to light the LED at about 1.8 amps output current (that’s a LOT of locomotives pulling a LOT of cars). If you want an earlier warning (1.2 amps), try 0.5 ohm 1 watt. These are not your garden-variety resistor; if you have a parts box, go hunting; otherwise, you can visit Radio Shack and pick up three 1 ohm 10 watt wirewound resistors and parallel them to yield 0.33 ohms. RS also has an 0.47 ohm 5 watt wirewound. Want a different limit? Calculate the resistor value from R (ohms) = 0.6 / (current value you want in amps); don’t forget the calculate power: P (watts) = 0.36 / R.
3. For connecting to the power pack and the track, I suggest a 4-position “barrier strip,” such as RS 274-658 or the like. 5. Wire size matters. You’re carrying some current in NAT, so the wiring to/from inputs and outputs should be at least #20 stranded; likewise the wiring to power transistor emitters and collectors. All other wiring can be smaller (ie, #22 – 26).